Decided it’s time to change up your look? The decision to rebrand is often a complicated one. Does your company need a logo facelift? Brand identity tweaks to reach a new market? Or a reputation overhaul complete with a brand new identity? Companies small and large rebrand for many reasons, but often it’s a shift in management or direction. Your company may have evolved beyond your current brand. Perhaps your vision has grown or changed over time or you need to leave mistakes in your past. One thing’s for sure: when you rebrand, it entails a great deal of time, effort and strategy. It’s not a choice to take lightly. Using outdated printed materials, hanging on to old designs, and sticking to signs that don’t capture your brand’s new image and personality? That’s a recipe for a rebrand fail. Rebranding entails more than simply updating your website or designing a new logo. In fact, your entire team should be embracing your new brand identity so it really resonates with your customers, too. Be sure these four rebranding must-haves are part of your rebranding checklist to ensure your new brand resonates. Even if your address hasn’t changed, updating your business cards to reflect your new brand is vitally important. For every 2000 business cards handed out, businesses see a 2.5% increase in sales. Clients hold on to color business cards 10 times longer than standard white business cards, while 78% of customers deem color business cards more memorable. So, investing in a quality updated set of printed business cards should become a top priority when you rebrand. In the days of email and digital correspondence, you may wonder if letterhead is still a necessary investment. Turns out, direct mail is still king when it comes to reaching your customers and getting a response. Many consumers — 41% –report they look forward to checking their physical mail each day. Letterhead is a necessary part of the process and using eye-catching letterhead will really help your brand resonate with your target audience. If your business uses collateral brochures, sell-sheets and pocket folders to showcase your products or services, don’t forget to include these printed materials in the rebrand. Don’t simply stick a new logo sticker over your old materials. Use your rebrand as an opportunity to really examine and update your message. Rebranding is about so much more than using new logos and colors: it’s about crafting a new voice. It’s vital your marketing materials reflect who you are. So many important components go into your printed materials. They should be well-designed, showcase your unique advantage to your customers, convey your quality, credibility and the values of your company. If you need assistance crafting a new message, our creative design team will work closely with you to produce quality brochures, sell-sheets, pocket folders and other materials that connect. One of the biggest roadblocks to getting your rebranding to work? The mindset of your team. It’s tough to change old habits, but from day one of your rebrand, your team should be using the new company name, logo and identity. You must walk the walk of your new brand—and that requires a cultural shift within your entire team. Get your team excited about the “new you” by explaining the meaning and larger vision behind your rebranding. Give them extra materials emblazoned with your new logo to make the rollout an exciting chance to rally and foster team pride. 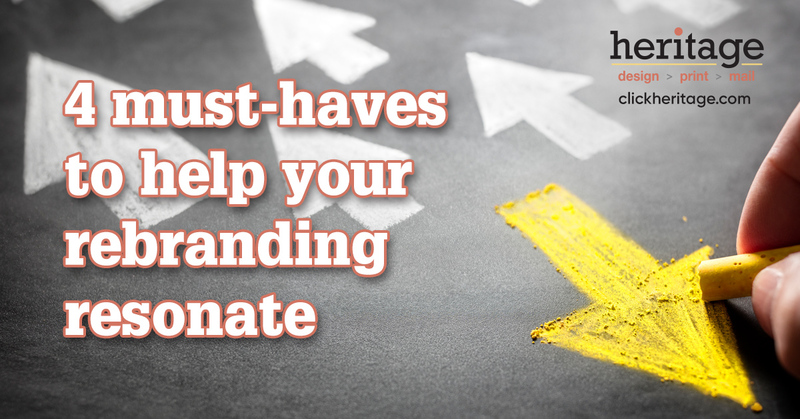 A lackluster attitude about your new brand can thwart the change, so keep your team enthused by including them every step of the way as you embark on the exciting new horizon for your company. Rebranding is a big process. If you’re ready to do it right, we’re here to help. We’ll assist you with crafting the perfect new message and creating stand-out printed materials to showcase your new identity. Boost your rebranding’s staying power with Heritage Printing in Milwaukee, Wisconsin.